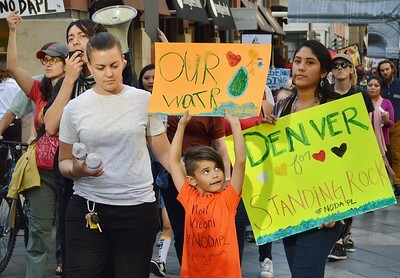 About 300 people including Native Americans rallied and marched through downtown Denver, Co in support of "water protectors" protesting the Dakota Access Pipeline in North Dakota. 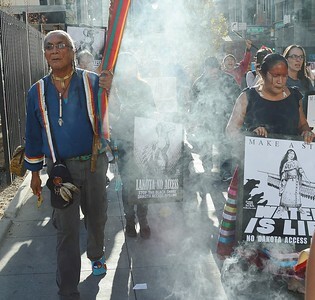 Native American man and woman leading march against Dakota Access Pipeline. 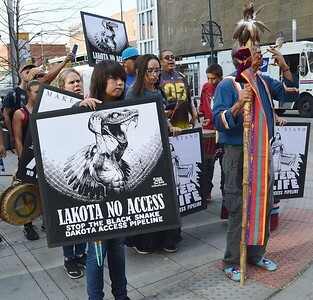 Native American man and woman leading march in Denver, Co. against Dakota access pipeline. 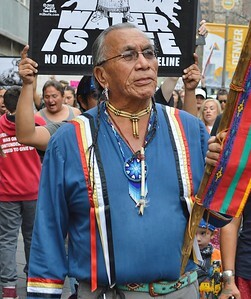 Native American man marching against the Dakota Access Pipeline in Denver,Co. 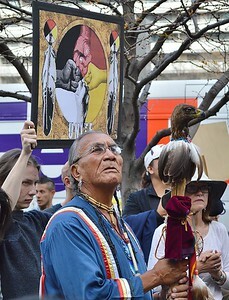 At Dakota pipeline protest in Denver, Native American man holding walking stick with eagle on the top looking up, behind him, young man holds sign above head. 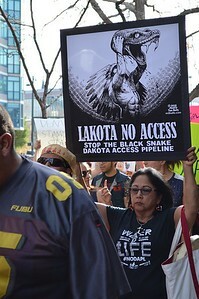 Woman raises "Lakota No Access" sign above her head while marching against Dakota pipeline. 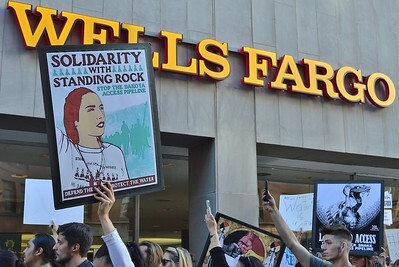 Opponent of Dakota Access Pipeline raises sign in the air that says "Solidarity With Standing Rock" at protest in front of a Wells Fargo Bank, bank sign in the background. 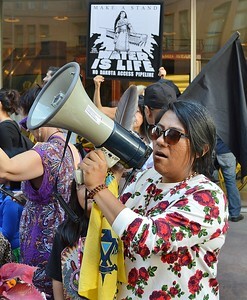 Woman speaking througth a bullhorn at protest against Dakota Access Pipeline. 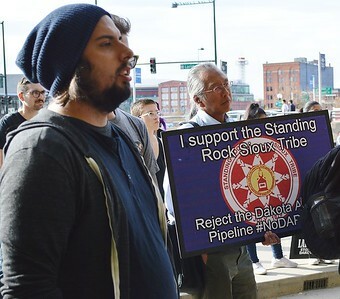 Native American man raising hand in air during rally against Dakota Access Pipeline. 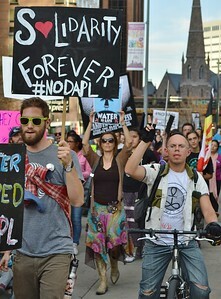 Opponents of Dakota pipeline marching in downtown Denver. 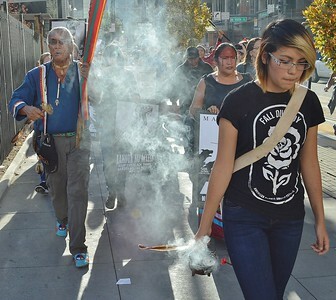 Opponents of Dakota pipeline marching through smoke from incense in downtown Denver. 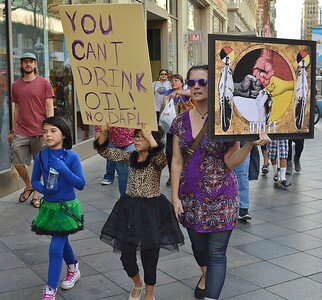 Young child raises hand made sign above head that says "Our Watr", two women march beside her at protest against Dakota pipeline. 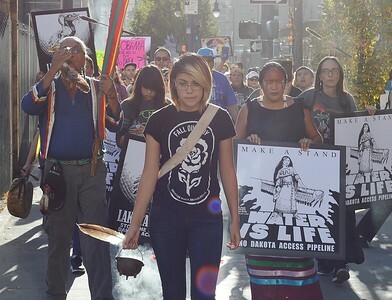 Native American woman carries "Water Is Life" sign while leading march against Dakota Access Pipeline. 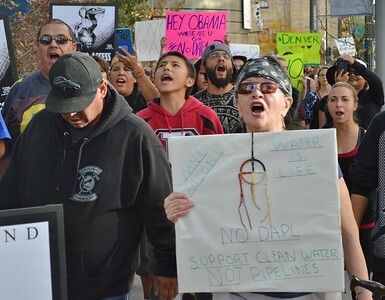 Native American man speaks to rally against Dakota pipeline, woman next to him holds a bullhorn. 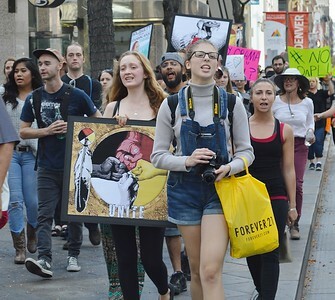 Group of marchers protesting Dakota Access Pipeline. 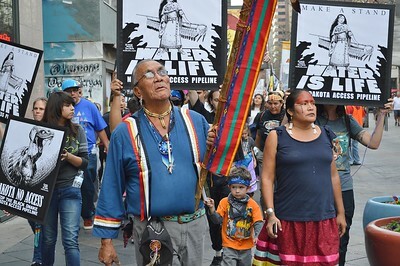 Woman carrying young child during march against Dakota pipeline, young man behind them holds anti pipeline sign above his head. 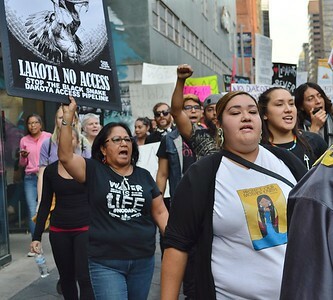 Woman holds "Lakota No Access" sign above head while marching in protest against Dakota pipeline. 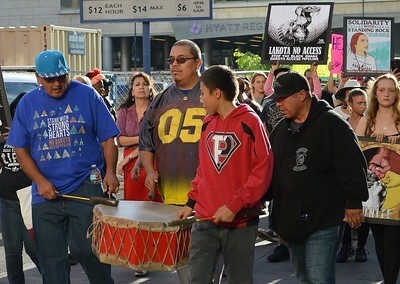 Group of Native American men carry drum during march against Dakota pipeline. 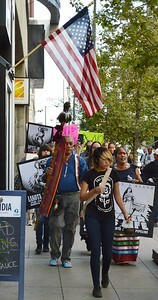 Marchers protesting against Dakota pipeline march under an American flag hanging on a building. 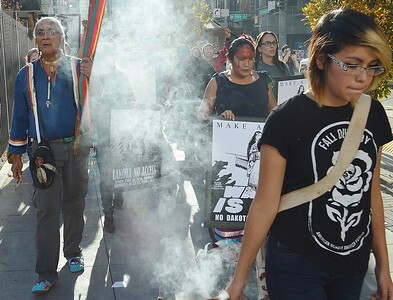 Group of women in march against Dakota pipeline, others behind them holding signs in the air. 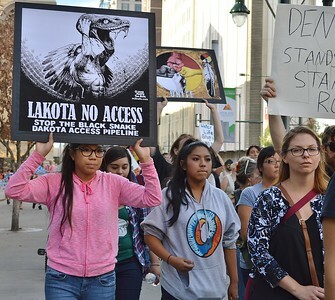 Young woman holds "Lakota No Access" sign above head while marching in protest against Dakota pipeline. 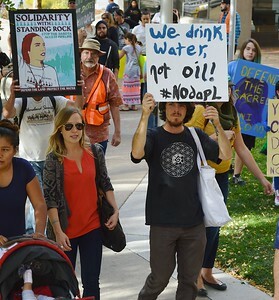 Young woman marching in protest against Dakota Access pipeline large group of people with signs behind her. 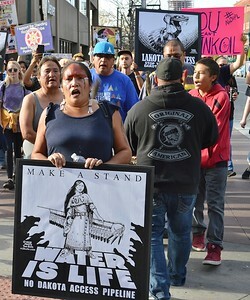 Opponents of Dakota pipeline shouting while marching with signs. 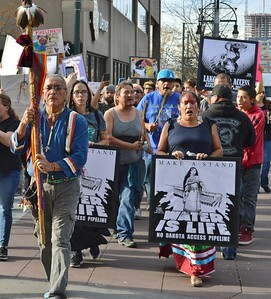 Opponents of Dakota pipeline marching in Denver. 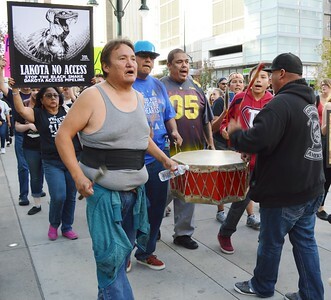 Native American men beating on a drum while leading march against Dakota Access Pipeline. 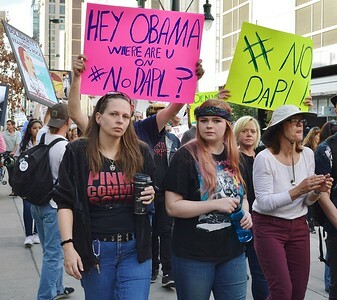 Woman raises cellphone to take picture while marching against Dakota Access pipeline, marchers with signs behind her. 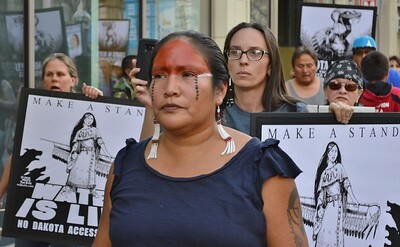 Native American woman wearing face paint leading march against Dakota pipeline in Denver,Co. 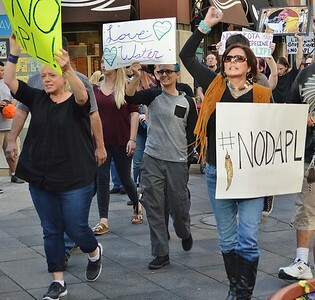 Woman carrying "#NoDAPL" sign, raises fist in the air while marching in Denver. 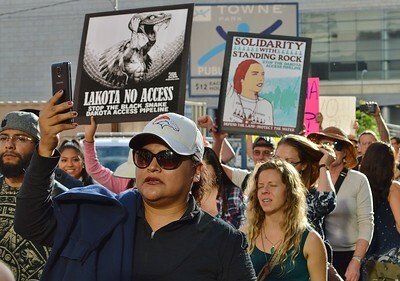 Line of people marching to oppose Dakota Access Pipeline. 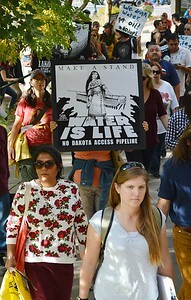 Dakota pipeline opponents carry signs during march. 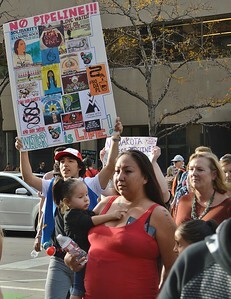 Woman and two young children carry signs while marching in protest against Dakota pipeline. 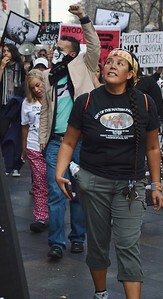 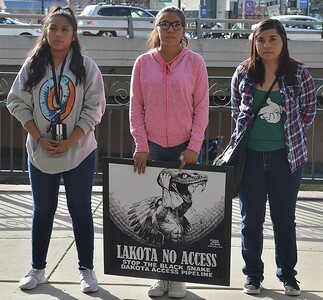 Three young women marching in protest against the Dakota pipeline in Denver,Co. 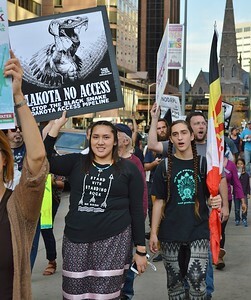 Protesters with signs march against Dakota Access pipeline. 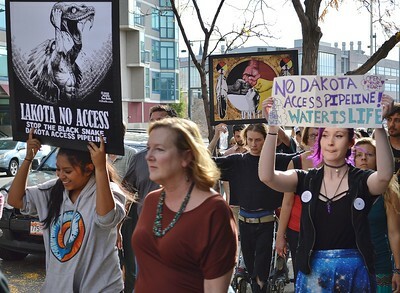 Protesters in Denver,Co marching against the Dakota Access pipeline. 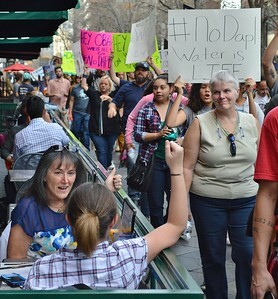 Restaurant patrons react to marchers protesting Dakota Access Pipeline passing by them as they have lunch. 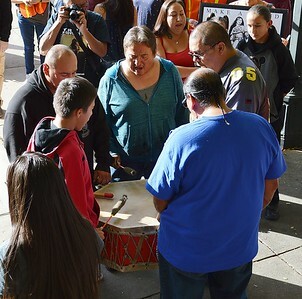 Native Americans druming during rally against the Dakota Access Pipline. 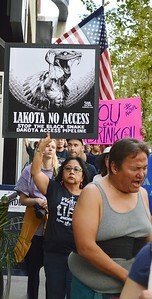 Young woman holding "Lakota No Access" sign at pipeline protest. 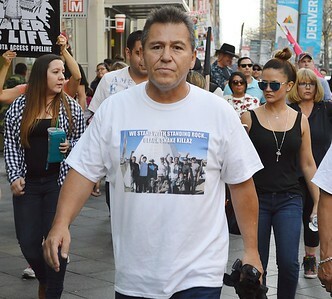 Man wearing t-shirt about Standing Rock, marching in protest against dakota pipeline. 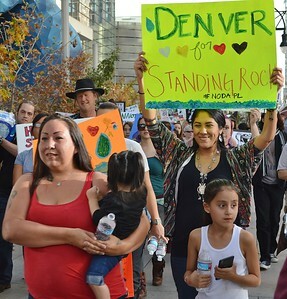 Opponents of Dakota Access pipeline at rally in Denver, one holding sign in support of Standing Rock Sioux. 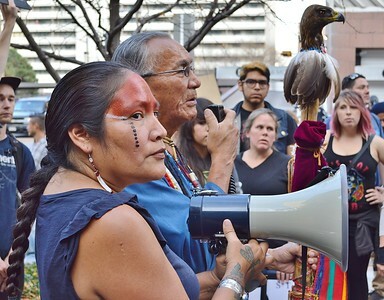 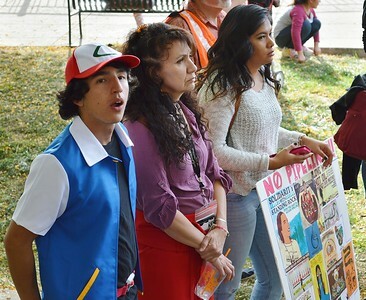 Dakota Access Pipeline opponents listen to a speaker at a rally in Denver.